The Assyrians (Syriacs) of today are the indigenous Aramaic (Syriac)-speaking descendants of the ancient Semitic Assyrian people, one of the earliest civilizations emerging in Mesopotamia, and have a history spanning over 6760 years. The Assyrians are Christians, with a unique language, culture and heritage. Although the Assyrian empire ended in 612-605 B.C., history is replete with recorded details of the continuous presence of the Assyrian people till the present time. The Assyrian kingdom, being one of the base roots of Mesopotamia, encouraged urbanization, building of permanent dwellings, and cities. They also developed agriculture and improved methods of irrigation using systems of canals and aqueducts. They enhanced their language that served as a unifying force in writing, trade and business transaction. They encouraged trade, established and developed safe routes, protecting citizens and property by written law. They excelled in administration, documented their performance and royal achievements, depicting their culture in different art forms. They built libraries and archived their recorded deeds for prosperity. They accumulated wealth and knowledge; raised armies in disciplined formation of infantry, cavalry and war-chariot troops with logistics; and built a strong kingdom, an unique civilization and the first world empire. The heartland of Assyria in Upper Mesopotamia lays in present day northern Iraq, northeastern Syria, southeastern Turkey, and northwestern Iran. The remains of the ancient capital of Assyria, Nineveh, is next to Mosul in northern Iraq. Prior to the Assyrian Genocide which occurred before, during and after World War I, the major Assyrian communities still inhabited the areas of Harran, Edessa (Urhoy), Tur Abdin, and Hakkari in southeastern Turkey, Gozarto in northeastern Syria, Urmia in northwestern Iran, and Mosul in northern Iraq as they had for thousands of years. The world’s 3-4 million Assyrians are currently dispersed with members of the Diaspora comprising nearly one-third of the population. Most of the Assyrians in the Diaspora live in North America, Europe and Australia. The remaining Assyrians reside primarily in Iraq and Syria, with smaller populations in Turkey, Iran, Lebanon, and Jordan. 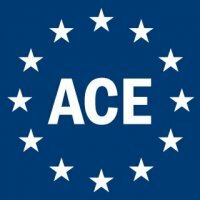 The Assyrians are not to be confused with Syrians even though some Syrian citizens are Assyrian. 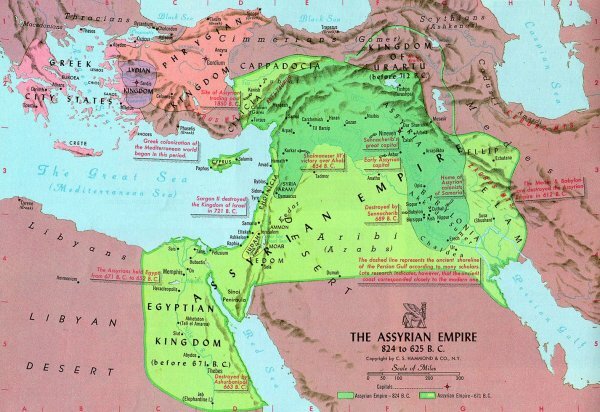 Although the name of Syria is directly derived from Assyria and Syria was an integral part of Assyrian civilization, most of the people of Syria currently maintain a separate Arab identity. Moreover, the Assyrians are not Arabs but rather have maintained a continuous and distinct ethnic identity, language, culture, and religion that predates the Arabization of the Near East. In addition, unlike the Arabs who did not enter the region until the seventh century A.D., the Assyrians are the indigenous people of Mesopotamia. Until today, the Assyrians speak a distinct langauge (called Aramaic [Syriac]), the actual language spoken by Jesus Christ. As a Semitic language, the Aramaic language is related to Hebrew and Arabic but predates both. In addition, whereas most Arabs are Muslim, Assyrians are essentially Christian. 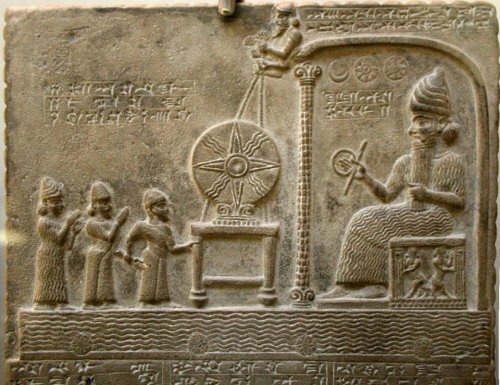 The Assyrians were among the first to accept Christianity in the first century A.D. Divisions exist between the speakers of Northeastern Neo-Aramaic, who mostly belong to the Ancient Church of the East and Chaldean Catholic Church and have been historically concentrated in what is now northern Iraq, northwestern Iran, and southeastern Turkey, and speakers of Central Neo-Aramaic, who traditionally belong to the Syriac Orthodox Church and Syriac Catholic Church and have been historically concentrated in what is now southern Turkey, northern Syria and northern Iraq. The Seyfo (A.K.A. Sayfo) Genocide of 1915 is the turning point in the modern history of the Assyrian Christians precisely because it is the single event that led to the dispersal of the surviving community into small, weak, and destitute communities. The Assyrian civilian population of upper Mesopotamia (the Tur Abdin region, the Hakkâri, Van, and Siirt provinces of present-day southeastern Turkey, and the Urmia region of northwestern Iran) was forcibly relocated and massacred by the Muslim Ottoman (Turkish) army, together with other armed and allied Muslim peoples, including Kurds. The Assyrian Genocide took place in the same context as the Armenian and Greek Genocides. 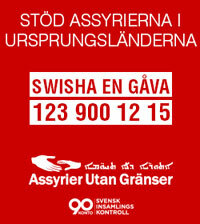 More than 500.000 Assyrians were killed during the Seyfo Genocide. During World War I, after the Assyrians sided with the victorious Allies, Great Britain had promised the Assyrians autonomy, independence, and a homeland. The Assyrian question was addressed during postwar deliberations at the League of Nations in 1919. However, the promise of a free and independent Assyria turned out to be just empty words. Other interests, like oil, weighed much heavier for the British than their promises to the Assyrian nation. With the termination of the British Mandate in Iraq, the unresolved status of the Assyrians was relinquished to the newly formed Iraqi government with promises of certain minority guarantees specifically concerning freedom of religious, cultural, and linguistic expression. The Simele Genocide of 1933 was the first of many massacres committed by the Iraqi government during the systematic genocide of Assyrians of Northern Iraq. The term is used to describe not only the massacre of Simele, but also the killing spree that continued among 63 Assyrian villages in the Dohuk and Mosul districts that led to the deaths of an estimated 3,000 innocent Assyrians. Today, most of these villages continue to be illegally occupied by Arabs and Kurds. Currently, the Assyrians are religiously and ethnically persecuted in the Middle East due to Islamic fundamentalism, Arabization and Kurdification policies, leading to land expropriations and forced emigration to the West. Today there are more Assyrians living in the West than in their ancestral homeland, and this exodus has accelerated sharply in the 21st century. 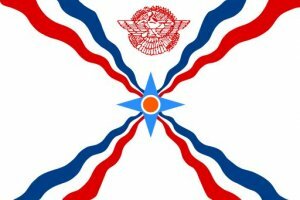 The modern Assyrian flag from 1968 is the flag chosen by the Assyrian (Syriac) people to represent the Assyrian nation in the homeland and in the diaspora. 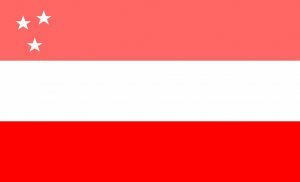 The Assyrian star in the flag is borrowed from the ancient Assyrian symbol of Shamash see the picture below.